Opening Range Breakout (ORB) is a commonly used trading system by professional and amateur traders alike and has the potential to deliver high accuracy if done with optimal usage of indicators, strict rules and good assessment of overall market mood. This system is applicable only for intraday trading. ORB trading has several variations practiced by traders all over the globe. Some traders trade on a significant breakout from opening range, while others trade immediately on opening range breakout. Time window for the trades also varies from 30 minutes to 3 hours. 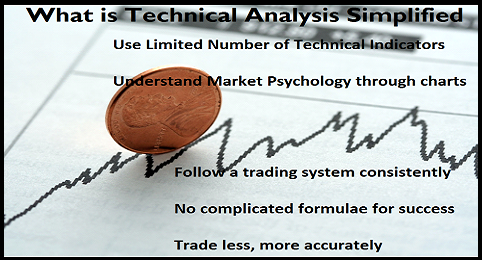 Over a period of time observing and trading Indian markets, I have devised with the below system suiting our markets. Below method is both a scalping and a trending system combined into one, hence it is possible to take the advantage of quick moves and trending markets with multiple lots of trades. Posting this video for introducing important concept of day's high / previous day's high and its use in Intraday Trading. In my pre-market calls on 28 March, I had given a buy of ICICI Bank above the high of 27 March - 1027. Previous day's high is an important resistance level if the stock opens below it. On 28 March, ICICI opened below the previous high and remained below that level until the last hour of trading. Overall markets were moving up and ICICI also crossed the days high with volumes. An entry there resulted in good profits. This is a pattern ( either moving above day's high or falling below day's low) towards the end of trading day is very common in Indian markets and can give handsome profits. Following additional confirmations are important to enter the trade - Increase in volume, technical indicators supporting the trade, Moving Averages trending in the direction of the trade. All these increases the chances of success dramatically. You can see all of these in this trade. Please watch the video to see the trade. Today is the last day of derivatives expiry and expect volatility. Sell on bounce looks like a good strategy for the day. 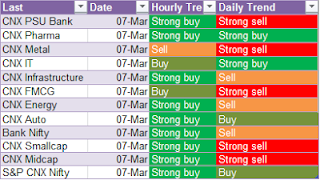 On 25th March, we had a good trading day with several of sell calls giving good profits. Tata Steel, L&T and BHEL were particularly good intraday sells. Support levels are 5600 , followed by 5565-50 levels. A break of this will open up 5500 levels. Avoid any intraday longs below 5600 levels. Nifty will be positive above 5660 and bullish above 5680 levels. We had good short sells on stocks hitting 52 week lows. So we will try to short them in the coming days as well. 1. Hero Motors – Sell on rise to 1586-90 levels with SL at 1600. Alternatively sell below 1566 for 1552-32 targets with SL at 1580. 2. 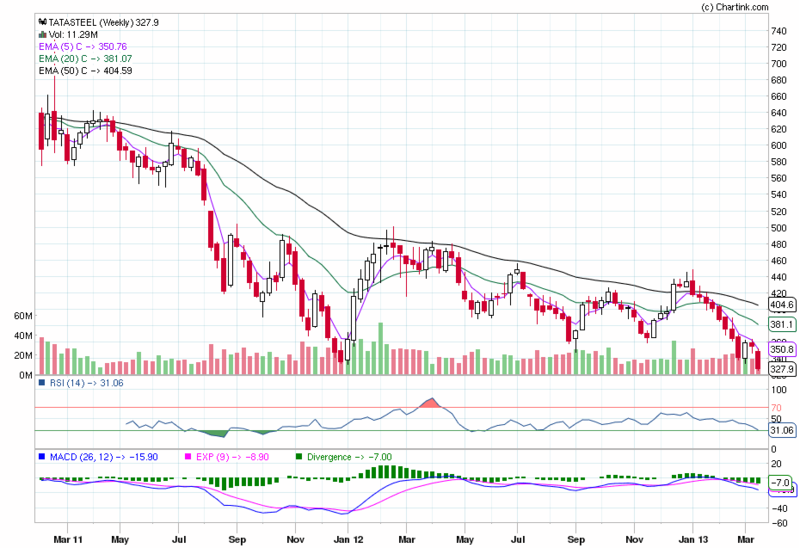 BHEL – Sell below176 for target of 175 – 173. SL 178. 3. L&T – Sell below 1330 with SL at 1350 for a target of 1320- 1310. 4. Reliance – Sell below 790 with SL at 799 for a target of 774- 768. 5. 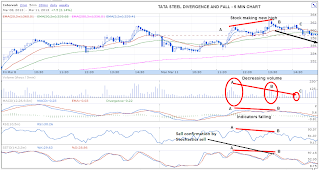 Tata Steel – Sell below 308 with SL at 312 for intraday target of 305. Below 305, fresh sell for target of 303-299 with SL at 308. 6. ICICI Bank – Buy above 1027 with SL at 1017 for target of 1032-1038. I covered ICICI Bank here. Please read my previous post. ICICI Bank is holding on to the level of 1000-1005. Any day it crossed below the level will see a strong down move. Keep watching this for any potential intraday selling opportunities. We were covering Tata Steel from 400 and then from 330 levels. It is close to the first target of 305. Bearishness is confirmed with this move and target of 290 levels is confirmed. On crossing below 300 will confirm target of 290. SL for any positional shorts is 321. Please read the Nifty short term view here. For 26 March, expect good amount of volatility due to expiry of March derivatives. Be quick to book small profits. Avoid any intraday longs below 5620 levels. Nifty will be positive above 5660 and bullish above 5725 levels. Several stocks are now close to their 52 week lows. These stocks show weakness and may be traded on the short side for good intraday gains in the next few days. Below is a partial list of these stocks. Tata Steel, Sail, Hero Motors, BHEL, ABB, Coal India, Reliance Infra, HDIL, Gail, NTPC, HPCL and Reliance Capital. Tata Steel is moving down in line with our expectations. Today 25th March, it hit a new 52 week low. Next target is 305. Below this, the stock could slide to 290 levels. Stock will be positive above 340. Today, we are covering the analysis on ICICI Bank, since I received several queries on whether this is the right time to invest in this stock. The answer is No as per technical charts. ICICI crossed below the 200 DMA earlier this month and is facing continuous resistance at 105-60 levels..
200 DMA was crossed with bearish MACD cross-over and RSI moving below 50. Todays move shows Stochastic staying below the oversold sign with no indication of a bounce back. Fall below 1000 levels and sustaining there on any day could take the stock easily to 980 levels followed by 970-950 levels. Below this, the stock could touch 910-880. As of now this looks to be the short term target for ICICI Bank. The above views will be negated on a close above 1080 levels. Another day of fall despite positive global cues ,this time on further domestic political uncertainty. In todays trade, Nifty just touched the level of5720 which was the level for the market to be positive this week. A relief rally as expected did not sustain and Nifty crossed below the support levels one by one and closed below 5640. From a short term perspective, it is now clear that Nifty is likely to touch its 200 DMA 5616. Closing below this level has the potential to take Nifty to 5500 and finally to 5300. Seeing today’s close, the kind of support the 200 DMA can provide looks to be very weak and the market is now fully into bear grip. 5300 to 4800 may be considered for long term investments either directly through stocks and ETFs or through Mutual Funds. It is hard to believe the bearishness in our markets if we look back the run-up during the second half of 2012. Unfortunately this is the truth. Regular followers of this blog would have noticed that the first warning sign was in January of a possible correction and subsequently support levels one after the other were broken. Now 200 DMA is the last hope for bulls. Sell Bajaj Auto below 1805 with SL at 1825. We saw a series of support levels being broken last week starting from 5880. This has the potential to take Nifty to 5500 levels. If this level is broken, then the doors for 5300 will be opened up. Next week is short trading week with holidays on 27 March and 29 March.Expiry of March derivatives also falls in this week. Overall markets will tend to be volatile with attempts for a relief rally to the resistance levels close to 5725. Next significant resistance is at 5745 followed by 5800 – 5880. US markets closed strong on Friday and based on the fact that the negative news on domestic financial irregularities, political uncertainty and RBI stance has been factored already into the market, the chance is that on Monday markets will try to rally. For the week, if Nifty sustains above 5720-25 levels, buying will come into the market despite the volatility due to expiry. Potential target for the week is 5800. Support levels for tomorrow 5625 , followed by 5590 levels. A break of this will open up 5550 levels. Avoid any intraday longs below 5640. Nifty will be positive above 5660 and bullish above 5680 levels. Will be updated before market opening.. I had covered Tata Steel right from 400 levels till 330 and was maintaining bearish view. 330 was a crucial support level We did several successful day trades on the short side. Nifty made wild swings on Thursday and finally crossed crucial supports and ended in red. News in the domestic front and European news – all contributed to the fall. European and US markets also ended in red yesterday. Overall, the market sentiment is bearish globally at least for the trading on Friday. Nifty today closed below another support of 5680 which is further confirming the bearish trend which started from the day 5880 support was broken. I had covered the importance of this level in my previous posts. Today we are down 200 points from that level. Several traders bought futures and call options in the past few days hoping for a recovery and big returns, most of them have left the markets in big losses. Their last hope was a rally today , which was in fact a chance to exit. Many were not ready to book losses on 5900 CE when 5880 was broken. Instead they hoped that they will be in profit soon. It is always important to go with the trend rather than go against the trend and hope for a recovery. Coming back to the views for tomorrow. Support levels for tomorrow 5645 , followed by 5615 levels. A break of this will open up 5570 levels. Unfortunately there are not many strong support levels till 5570 which is a matter of concern. Avoid any intraday longs below 5680. Nifty will be positive above 5700 and bullish above 5745 which is a quite unlikely move. 1. Hero Motors – Sell below 1615 for a target of 1605 with SL at 1636. Sustaining below 1605 will take the stock further down to 1585 levels. 2. Bajaj Auto – Bajaj Auto crossed the level of 1805 which we were tracking few days back and the stock had a high volume fall. Sell below 1740 with SL at 1760 for a target of 1715. 3. Tata Steel – Sell on sustain below 325 for a target of 322 with SL at 328. Below322, the target is 318. 4. HCL Tech – Sell below 767 for a target of 763 followed by 758with SL at 782. 5. Infosys – Sell below 2855 for a target of 2840 with SL at 2875. 6. BHEL – Sell below 179 for a target of 178 and 176. SL is 181.50. I have provided several calls since all of them might not trigger. Do not take more than 1 position at a time as news based moves could result trigger SLs. Please take positions only after 9:35 AM. Today we saw significant volatility with market swinging in both directions. These kind of markets may be day traded only by having clear levels and discipline in mind. We had 2 sell calls in the pre-market calls for today which fetched handsome returns to the followers. Out of our pre-market calls, only the two sell calls triggered. 1. Tata Steel – Below 333, it touched 325. 2. ONGC – Below 300, the stock touched 294. Hope readers enjoyed these trades. Once more re-iterating the fact that trading less is the only way to earn profits consistently. It is not necessary to make several trades and take bigger risks. Instead, trade based on levels and charts, when both support the trade. 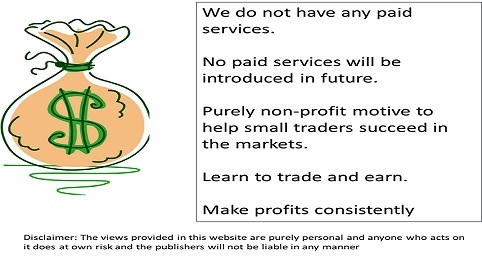 This is the trading system we have here and followed by many successful traders. Please try following this approach and I am sure you will make lot of money. Today many people lost heavily since they were short when 5700 was crossed, but immediately Nifty shot up without any stop to 5745 resistance level triggering all stop losses. Then those who went long at 5745 could not book profits before the Nifty made steep fall from 5760 levels. In such swings , individual stocks will respect the support resistance levels better than Nifty and this is one of the reasons why we do not trade in Nifty here. In continuation to yesterdays fall, Nifty further slided and closed down by more than 50 points today. Markets seemed to be fully digesting the news. Banks and Reality were worst hit in this fall. A bounce back is expected in todays trade. Review of 19 March trades. 3 successful trades from pre-market calls. TCS long – booked close to cost since markets started falling. A close below 5800 on 19 March has resulted in close to 100 points loss. Nifty closed yesterday just below 5700. Nifty touched 5680 level and bounced back during the last hour of trade. This bounce could continue till 5725-30 levels. Crossing this and sustaining above will take the Nifty to next resistance of 5770. Avoid any intraday longs below 5700. Nifty will be positive as long as 5700 is held and bullish above 5730. 3. Cipla – Buy above 394 with SL at 388 for a target of 396. If stock sustains above 396, then 388-90 is the target. 4. Tata Motors – Buy above 287 with SL at 282.5 for a target of 290. Is the stock sustains above 290, then 292 is a possible target. 5. Hero Honda – Buy above 1660 for a target of 1680. SL 1645. Please do not trade blindly on these levels. A buy position should be supported by charts giving positive signals. A sell position should be supported by charts giving negative signals. Please see real trades inearlier posts to understand how an intraday long or short is created. Those who traded based on my pre-market calls, book profits now, 5670—80 is support zone for Nifty. Yesterday Nifty crossed well below the support level of 5800 and 5780 which we thought would act as a low in the interim. RBI rate cut was as expected and already factored in the market movement in the past few days. Overall RBI’s cautious stance and the news on political uncertainty in the country led to a sell of with Nifty closing down close to 90 points. 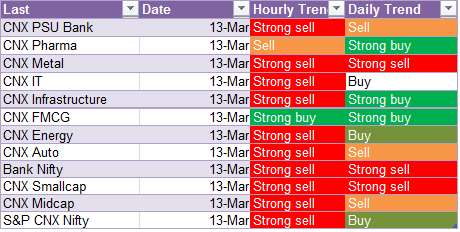 I could not post yesterdays trades separately due to time constraint. Post RBI announcement was made, the only stock which I could trade from my watch list was Tata Motors. Below 285, Tata Motors hit the target of 280 and made another low close to 279. As I have been writing here, crossing below 5800 is not a good sign for Nifty and the overall bearish trend is now confirmed for the short term. Going forward, 5800 will act as a tough resistance. Support levels for today are 5725 followed by 5700. Crossing below 5700 any day will take the index to 5670-80 levels. For today, market will be positive above 5780. Below this levels, no longs are recommended. 1. 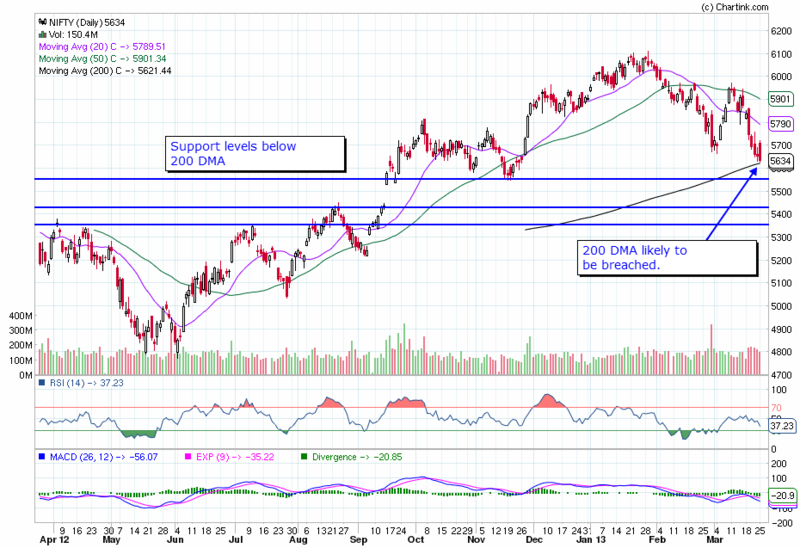 ICICI Bank – closed below a critical support level yesterday. Recovery up to 1040 levels is possible which will act as a resistance. Today selling positions may be taken below 1020 with SL at 1042. Targets are 1010 and 1000. Below 1000, the stock could slip to 990. 2. L&T – Sell below 1460 for a target of 1450. SL is 1480. 3. BHEL – This stock ever since it crossed the support at 199 levels, has turned extremely bearish. Sell below 185 for a target of 182 and 179. SL is at 189.50. 4. Tata Motors – Sell below 278, for a target of 276 and 272. SL for shorts is 284. 5. Bajaj Auto – Sell below 1805 for a target of 1790 with SL at 1820 levels. Dear Readers, those who are holding remaining lots in Bajaj Auto book full profits. From 1835 to 1805 levels , close to 30 points profit. Bajaj Auto Intraday - 10 points book partial profit and revise SL to cost for remaining lots. Bajaj Auto is a sell below 1635 with SL at 1645 and Hero Motors is a sell below 1670 with SL at 1685. Enter shorts with strict SLs. 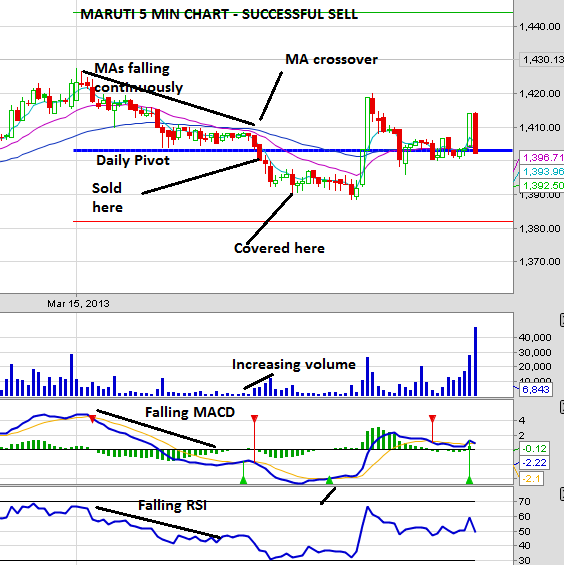 Dear Readers, another video of a real trade in Maruti on 15th March. For details on the trade click on the below link. Short was entered in Maruti just below 1402 and partial profits were booked close to 1393. This trade shows the importance to book profits as soon as you see it and hits your first target. Also important to revise SL to your cost for the remaining holdings. Please see the trade by clicking the video. Hope you would like this visual commentary on the trade. Today was very volatile for the first half with a down move in the beginning and V shaped recovery with volatality after the data was announced. Todays inflation data gave hopes to the market that there will be a positive movement from RBI on March 19 and there will be a reduction of 25 points in the key lending rates. 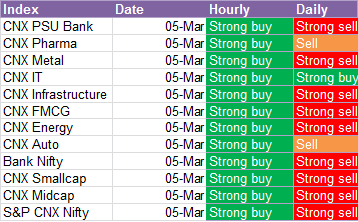 Banking sector rallied and SBI and ICICI made significant upmove. Axis bank however made only a moderate upmove. 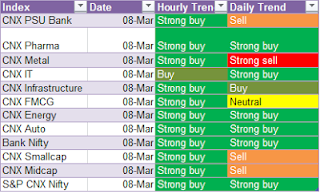 Most of the sectors have turned buy in daily and hourly charts. In Auto, Maruti crossed above the resistance of 1410 and made significant upmove. Hero Honda and Bajaj Auto closed in the red. Dow has made another record high in todays trades and overall global market mood indicates that Nifty is likely to move up on Friday first half with little bit of profit booking during the second half. Be cautious about the domestic news on financial irregularities, any remarks announcements on this during market hours in next few days could trigger a down fall. Nifty will remain positive above 5880 levels where majority of buying happened on Thursday. All intraday longs should be exited below this. On the higher side, resistances are 5950 followed by 5975. If sustained above 5975, the index could hit 5990-6000 where there will be major resistance. I do not expect a move above this on Friday. On the down side, support is at 5880- 5860-5840. Nifty is unlikely to fall below this. 1. Hero Honda - We had a successful short on Hero Honda today. I would like to trade a further short on Hero Honda. Below 1676, Hero Honda is negative. First target is 1660-56. Sustaining below 1654, Hero Honda will go to 1645 – 1631 levels. 3. ICICI Bank – Buy only above the previous resistance level of 1125 for a target of 1130-40. SL for long is 1110. 4. Reliance – Buy above 865 for a target of 870 and 880. SL for longs is 853. 5. L&T - Buy above 1535 for a target of 1540 –1555 with SL at 1515. As usual enter only after 09:35 AM. Any significant news which affects individual stocks or overall market direction will invalidate the technical analysis behind the above views. In such a situation use real time charts to trade.All the views and contents mentioned in this blog are the personal observations of the author and is in no way a recommendation for the readers to enter into trades of stocks/futures. The author do not accept any liability/loss resulting from the use of any content from this blog. Any act of trading performed by readers should be at their own discretion and neither the author or the sources mentioned in the blog will be responsible for the outcome. Market had a significant upmove. I could not take full advantage of this, since I was awaiting my level of 5920 to be crossed to be bullish overall. Today's high was exactly at 5920. 1. 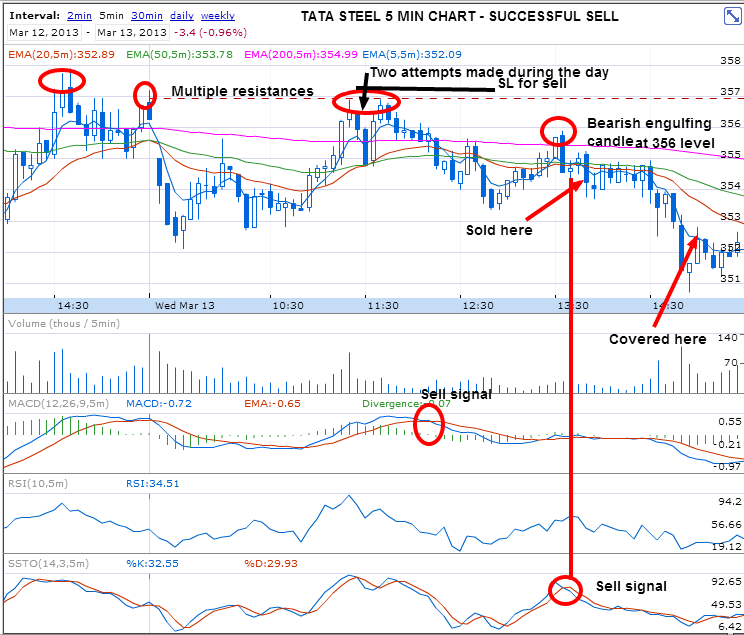 Tata Steel - Sold below 352 and covered at 348 as per my pre-market call. 2. Hero Honda - As per the alert I gave here, I sold below 1700 and could squeeze in 5-6 points profit. 3. ICICI Bank - Nifty crossed 5860 and ICICI as well recovered from days low and crossed the critical resistance of 1095 which was incidentally the high made in the initial 20 minutes. On crossing this, entered at 1097 and booked profit at 1110 levels. Hope the readers too made profits today. We might have missed some huge upmoves today since we were on the bearish side. But, markets will give plenty of chances in the coming days. So dont bother about lost opportunity. What is important for a day trader is to remain in net profit at the end of the day, every day !! Tata Steel touched the target of 347 below 352. Book profits and exit. L&T sell if it sustains below 1480. Today is a day with news flow and planning for the day in advance is a tough job. So we will basically play with levels. Risky traders are recommended to wait till market settles down after the WPI data is announced. Tomorrows WPI data will decide RBI stance on March 19. If you remember, for few days banking sector was rallying on the rate cut hopes, however this sector has fallen significantly in the last two days. PSU Banks and Bank Nifty as a whole have turned sell in daily and hourly charts. ICICI and Axis Bank were down close to 3% today and could continue downfall if inflation data is not supportive. Anyway no buying in banking is recommended even if the data is good. Metals continue to be strong sell in both hourly and daily charts. Auto has turned to sell in daily charts. Nifty could not climb above 5920 today and the support 5880 was broken. Tomorrow 5885 will be a major resistance, followed by 5920. Support will be 5840, followed by 5810. In case of a major fall, Nifty could go upto 5780. Any intraday long is recommended only above 5860. Shorts could be initiated as long as index is below 5860. I recommend no open positions close to 11 AM when the data is announced. Best would be to enter after 11:30 once the IIP data is digested. If any positions are taken at 09:30, if in profits, please book before the data is announced. Keep strict SLs. 1. 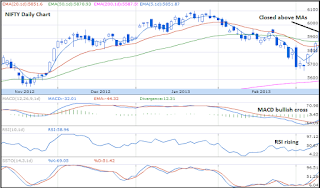 ICICI Bank – In daily charts, ICICI has crossed below 15 and 20 day moving averages and stochastics has given a sell. ICICI will face major resistance at 1095 and 1107. Reversals from these levels could be shorted. SL for shorts will be 1116. Below 1095, ICICI is a sell with target of 1080-75. If the stock sustains below 1075, then it could go to 1060-40 levels. 2. Axis Bank – In daily charts, Axis Bank is below 20 day EMA and resting at 200 day MA. Trade similar to ICICI. Major resistances at 1355 and 1375. SL for shorts is 1382-85. Below 1355, Axis is a sell with target of 1346, 1340. Sustain below 1340 could lead to 1330 and 1310 levels. 4. 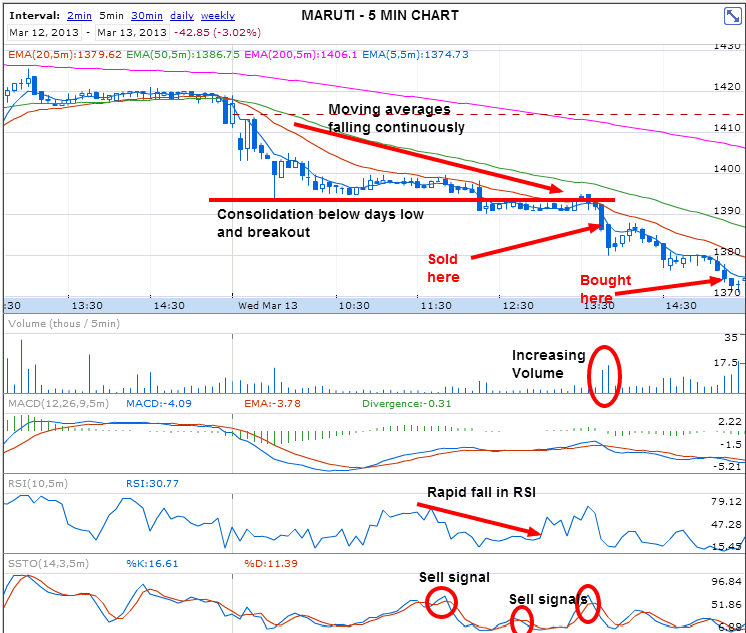 Maruti – Maruti is giving us daily profits on shorts for the past few days. Tomorrow however, Maruti is a sell on rise towards 1386-90 levels. with SL at 1410 levels. Target is 1380-70-60 levels. 5. L&T – Sell below 1480 for target of 1470 with SL at 1510. We have to maintain a high SL because of the volatality. Risky traders avoid. 6. 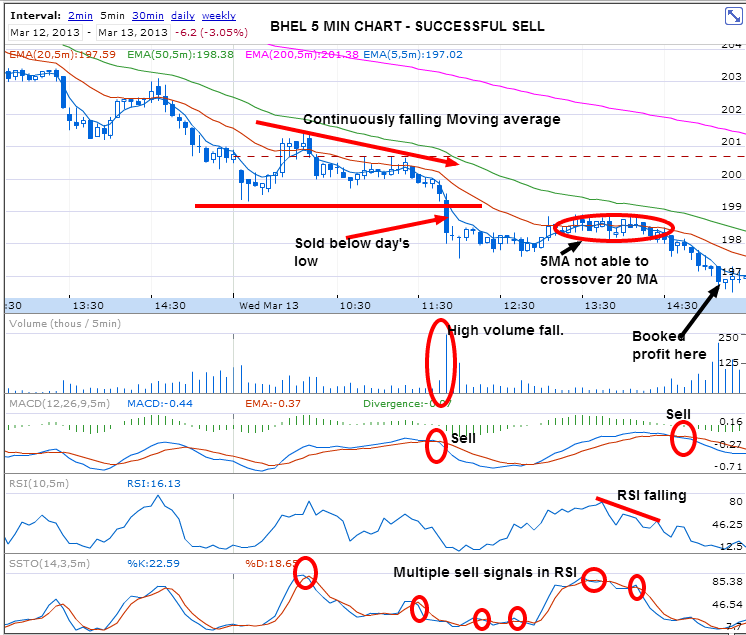 BHEL – BHEL was a good trade today , some more downside is left. Support was broken to day and the stock could go up to 195. Short with SL at 199. If 195-4 range is broken with volumes, then 190 will be the target in next few days. 7. 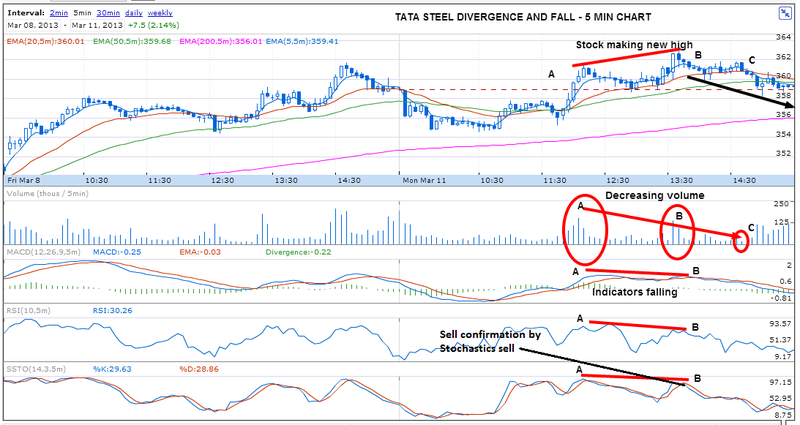 Tata Steel – Do not short as long as the stock is above 352. Sustain below 352-350 could see a target of 347. Risky to short since there is a positive news on the stock. Safe traders, please avoid the calls marked as risky. As usual enter only after 09:35 AM. Don’t enter into any long trades below 5920. It is risky. Reliance may be bought for intraday if the stock sustains above 855, don’t enter a spike above 855. Sharing my trades and lessons from today. As per my pre-market calls, I was mostly looking for selling opportunities in Banking, Auto and Metal stocks. Please read my pre-market calls here. Nifty was below my level of 5920 from market opening. Though market attempted to move above days high after 11 AM, there was heavy selling and the support of 5880 was broken convincingly. Most of the stocks opened below my sell levels and initially there were no opportunties to trade. 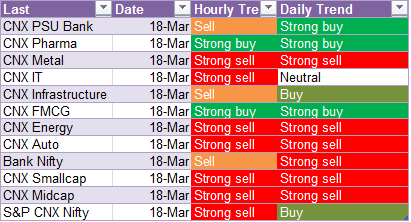 But overall Nifty weakness and stocks moving below days low coupled with observing divergences helped me to make the below trades. 1. 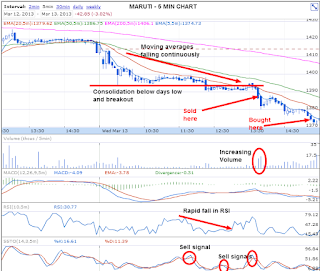 Maruti – Maruti was well below my sell levels, but was consolidating at the days low and finally crossed the days low along with weakness in Nifty. Please click on the chart for more details. 2. BHEL – BHEL was crossing days low and a crucial support, so I decided to short and alerted my readers in the blog. Please click the chart for more details. 3. 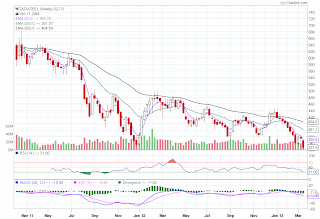 ICICI Bank – ICICI was much below my sell level. 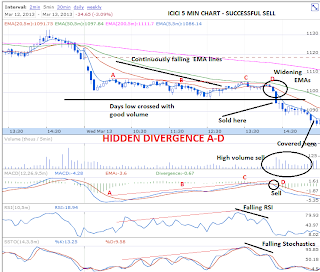 But I could see ICICI developing a hidden divergence during the second half of the day, hence I decided to short. The stock crossing day’s low confirmed my decision and it gave me several profit points. From the charts, I could also sense that the market is expecting negative news probably from the RBI meet later during the month. Axis Bank was falling in parallel and even SBI started to move down. Important concept of Hidden Divergence. 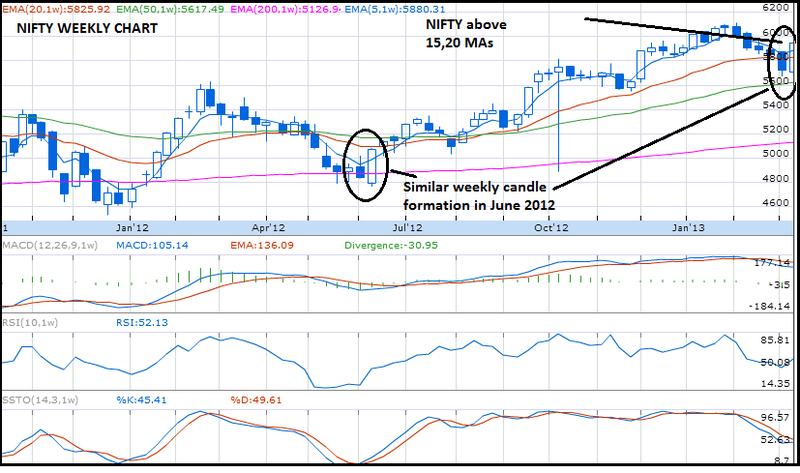 This is what you can see in todays ICICI Chart. Between points A-B-C-D, the price was falling down. But MACD and RSI were continuously moving up. From A to D both these indicators were moving up. Please click on the chart and go through my comments. y and made several attempts to move up during the first half of the day. However this was faced with selling and the stock moved below my sell levels of 356. I entered into sell position here several points profit. Please see the chart . 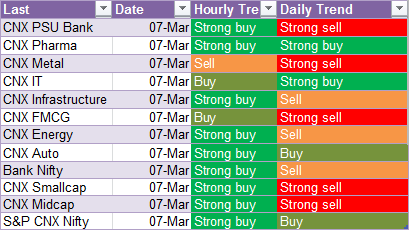 Other stocks from my watchlist which I did not trade. L&T – My sell level was 1515. Stock could not cross this, days high was 1512. There was a trading opportunity to short on rise to this level. SBI – There was a trading opportunity to sell below days low. Reliance – Attempted to cross 855, but was faced with selling exactly at this point. Hope my readers have made profits today. If you have any questions on these trades, please feel free to write here. Today, all trades profitable as per the levels in the pre-market calls. 2. 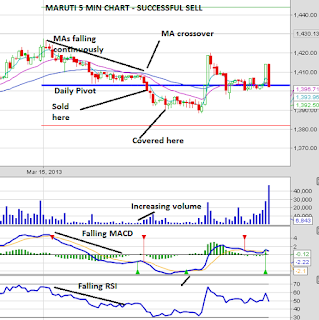 Maruti - Sold at 1410 and covered at 1405. 3. L&T - Buy above level not triggered. Days high at 1421. As I wrote in the pre-market call, L&T recovered sharply from days low. 4. Infosys - Sold at 2928 and covered at 2920. Hope everyone enjoyed the trades. I will post selected charts after market closing. ICICI and Maruti below their Sell levels. Below 2930, Infosys has touched 2920. Below 2920, we will see further fall. Markets did not show much of an action today and was choppy of whipsawing. Typically day traders lose money in such conditions. Also, keep in mind the fact that choppy markets tend traders to do more trades than less resulting in more losses. So strict discipline and respect for levels is important to restrict trades on such a day. I was mostly looking at the stocks and levels as per my pre-market analysis. Today was one of the classic days if entry was made before 15-20 minutes of settling down, all trades would have been in a loss. This is the reason that I always recommend 15-20 minutes waiting before entering any trade. If Nifty direction is not certain as today, you can wait up to 30 minutes or more. 1. ICICI – ICICI started falling right from opening and went below the 1145 level and also touched 1130 levels. Stock was oscillating between my levels 1130 and 1145, so practically no trade was possible during the day. 2. SBI – SBI made a high of 2221 within 15 minutes of opening and never crossed that during the day. The stock was only falling after that. My buy above level was 2220 which was never crossed since then. So no trade possible there as well. Chart was similar to ICICI. crossed 1500 with style to hit 1518. I could enter above 1500 and booked close to 10 points. 4. Cipla – My buy above level was 393 which was hit and first level of 395 achieved within 20 min of market opening. So I could not trade this. Thereafter every time 393 was crossed, the stock hit 395 and retreated. MACD and RSI was mostly horizontal in 5 min chart, the breakouts were without any volume. Second attempt to cross 395 was faced with huge selling and the stock made a low of 388. 5. 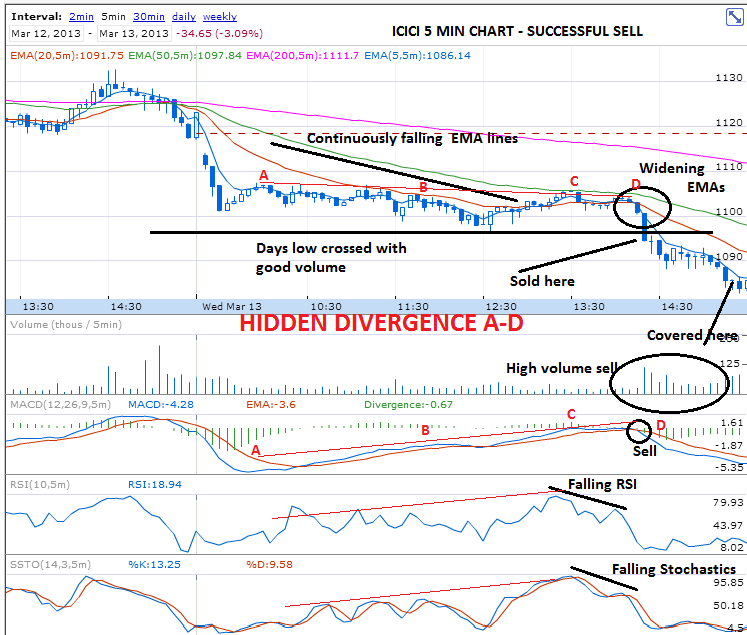 ONGC – I did not enter since the high made within 20 min of market opening was never crossed. At 09:50 my level of 328 was crossed from above and the stock never recovered. No trade here. 1. Wait for markets to settle even if it means 30 minutes before jumping into any trades. 2. Support and Resistance - Same day’s high is an important resistance to be crossed for longs. Same day’s low is an important support to be broken for shorts. I will be publishing calls for Tuesday soon after US Markets close. Tomorrow will be extremely difficult to make money either way because of news. But we can try based on levels. 20 min after days opening, I was looking for a buy above my level of 1128. However day’s high was acting as a resistance. Finally when days high crossed, MACD was sloping down and never really made a bullish crossover, so I did not enter here. In few minutes ICICI fell down, but still above the SL for longs which was at 1112 . 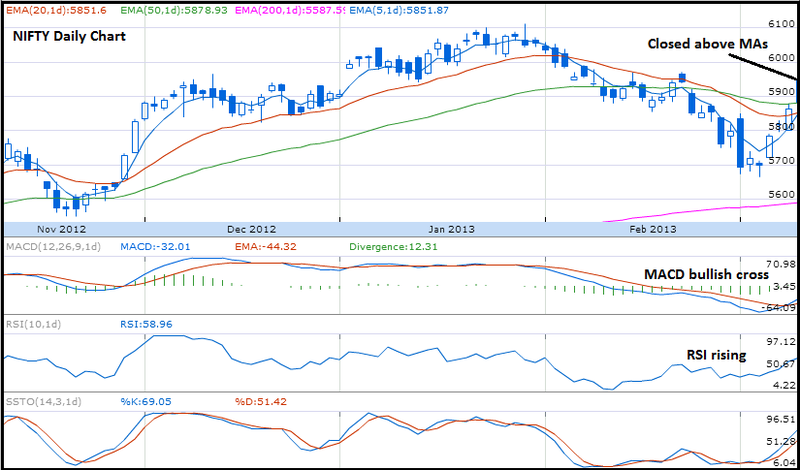 Finally second half, ICICI crossed the resistance with rounded bottom, MACD bullish cross, and upwards RSI. I entered and was luckily into the rally. Please click on the chart for more information. Why is our market moving up continuously. All sectors are participating in this rally. If you remember, we had a catastrophic fall on the budget day and everyone was negative about the future. What changed now ? Reason is simple. Lot of people went short in big numbers on the day of budget, thinking that it is the end of the world and Indian economy. Those who were wise bought the bottom on the budget day. Shorters are now trapped. From that day SLs are triggering for the bears and this is keeping markets up. Shorters are trying to exit every downmove and that is more than enough to support this market at this point in time. Again, I warn my readers not to trade based on a news. I had also written that markets will stabilize only in 2-3 days after budget and trend will emerge. This applies to all major news events. As as example, if you look at L&T chart, lot of people went short on the budget day. The stock started moving up from next day and one by one, their SL levels are taken off and this is moving the stock up. Some of the bears turned bulls, thinking that they can now make up for the loss if they reverse the position. ONGC made a fantastic upmove above the level 323.50. Keep trailing to maximize the profits. Markets made a strong recovery today with Nifty moving up more than 45 points and Sensex by 161 points. Quick look at the technical view of sectors. All sectors except metal are green in hourly charts. Today most of the metal stocks including Tata Steel, Sail, Hindalco, JSW Steel were down, so the sector ended up in red. Avoid trading this sector till there is a trend. 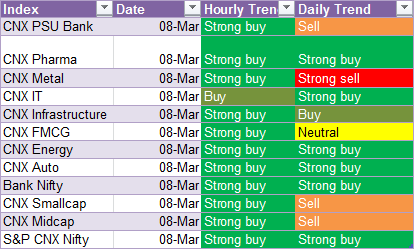 Pharma is still strong in hourly and daily charts, Cipla and Sun Pharma were positive today while Ranbaxy and Biocon ended in red. Cipla is a good choice for buy side. IT sector is also very strong. As anticipated in my previous posts, this sector is rallying. Infosys, TCS, Wipro, HCL all are rallying. Auto sector has started moving up, I am inclined to add one stock from this sector for trading. Today Hero Honda was up by 4% and Maruti , Bajaj Auto up more than 1%. Tomorrow being Friday, weekly traders will tend to take profits. So be watchful on the longs during the second half of the day. As usual, please wait for 15-20 minutes after market open, look at the combination of the levels and chart signals and trade. Today was a good day to trade with minimal volatility. Nifty was mostly stagnating the whole day and started rallying in the last two hours .Such days are good for intraday traders, since they get a chance to watch stocks for a long time and can buy or sell the stocks which are moving in the direction of Nifty breakout. ICICI, my buy level as per pre-market call was above 1110. ICICI was range bound most of the day, but never fell below the pivot. There was also a rounded bottom at pivot before the breakout. I bought above 1110 and sold with close to 8 points profit. Cipla showing consolidation and breakout attempt. It is a buy above days high sustain. ICICI consolidating above pivot, watchout and enter on break of days high. Today was a good day and most of the stocks went in the expected direction. Summarizing my trades below. 1. Trade 1 –Tata Steel – Success. In my pre-market analysis, I was looking at a buy signal above 346. Stock moved down after opening and then crossed this level which was the day’s high as well. Exited with good profits. Please click on the chart to see the entry and exit points. 2. Trade 2 – L&T – Success. L&T was up today after market opening, consolidated at day’s high and started moving up. Please click on the chart to see the trade. Readers, today was a very rewarding day with all trades going successful. Basically , I followed my own pre-market levels and traded based on the charts. For the purpose of educating the readers, I have included charts for the trades. Please read the pre-market calls first and then proceed below. This will give you an understanding of how you combine levels and charts for trading. Levels are support/resistance from charts in the last few sessions, pivot points etc. 1. 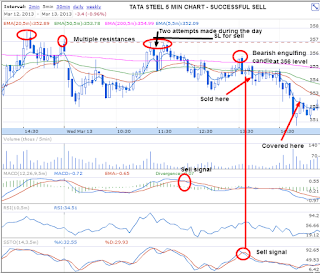 Trade 1 – Tata Steel (Success). I was expecting a bounce back in Tata Steel today as per my analysis here. Tata Steel started falling after open and crossed the pivot below. However it made a rounded bottom which is a very bullish sign and recovered. Crossed the pivot from below and sustained. Crossing the pivot from below is an extremely bullish sign. Markets was extremely bullish and the candles never went below the 20 MA line. So the position was held till end for maximising profits. L&T, basically respected the levels from last few days. L&T started falling after open and went below the daily pivot (blue line) , but recovered and crossed above the pivot. I entered here and was long mostly till end of the session. However L&T did not cross 1400 which would have triggered further rally. Cipla started falling continuously after market opening and hit the low of 369.30. 369 was my SL for any long trades, which did not hit. I waited to see if the stock crosses days high. Finally , I entered long position when the stock crossed day’s high and MACD, RSI and SSTO gave buy in 5 min charts. Please see the entry and exit in the chart. 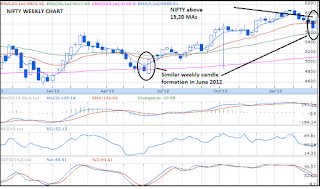 ICICI Bank – I avoided since the stock was gap up significantly above all the levels.